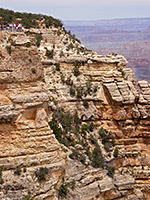 The majority of visitors to the South Rim first gaze over the Grand Canyon at Mather Point; although other places have slightly better views, Mather is the number one choice as it is closest to the entrance station, and a short walk from the visitor center (the Canyon View Plaza, opened in 2001). From summer 2010 the park road, which used to run right past the point and its rather small parking lot, has been rerouted a little way south, beside the visitor center, so now all visitors must park here and take a path to the rim. The visitor center is intended to be the northern terminus of a mass transit system, transporting people from large carparks in the village of Tusayan, but this is several years away from completion. 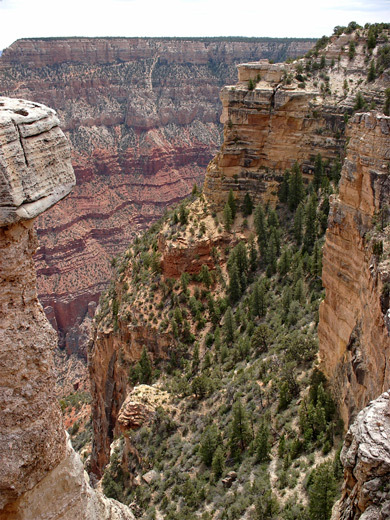 The viewing area is quite extensive - the point has two narrow, railed overlooks built on projecting rocks, various other view points along the rim in both directions, and to the west, the Rim Trail offers more vistas all the way to the next point (Yavapai). On the south side of the Colorado River, the panorama at Mather Point extends from the lower end of Garden Creek taking in some of the Bright Angel Trail, over the deep canyon of Pipe Creek and eastwards to Cedar Ridge/O'Neill Butte, along which runs the South Kaibab Trail starting from the next point to the east - Yaki. Some of the Tonto Trail is also in view, near Pipe Creek. 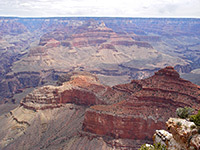 On the North Rim, the vista is centered on the long, straight Bright Angel Creek, flowing for 10 miles between a collection of tall red buttes and other ravines.